Vickie Y sharing another way to use your dies! Don't throw away the negative cut after you die cut, use it as a stencil. For my card, I used the negative cuts as stencils from the heart and rose card I shared last week. 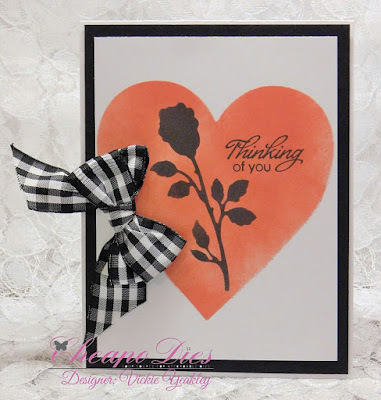 Lay the " heart stencil" on top of your cardstock panel and use a sponge to lay some ink onto the panel; then remove the "stencil" and lay the rose "stencil" on top of the heart and lay the color down. 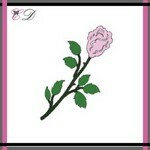 For the heart I used Worn Lipstick Distress Ink and for the rose I used VersaFine Clair Nocturne ink. I added a sentiment and embellished the finished card with a multi-loop gingham bow. 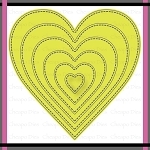 Dies used from the Cheapo Dies Online Store to create the "stencils"